I had the great pleasure of attending the 10th Annual TexSom Conference in Las Colinas (a suburb of Dallas) in early August. It was a fantastic event; very well organized, excellent educational seminars and top notch wine flowing at every turn. 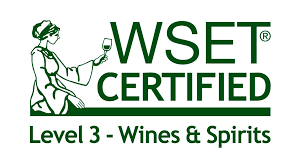 If you are a wine lover (enthusiast or connoisseur), wine writer, or industry professional, this conference is for you! Furthermore, the Four Seasons Hotel and Resort out shined even their own exceptional standards for hospitality and service. 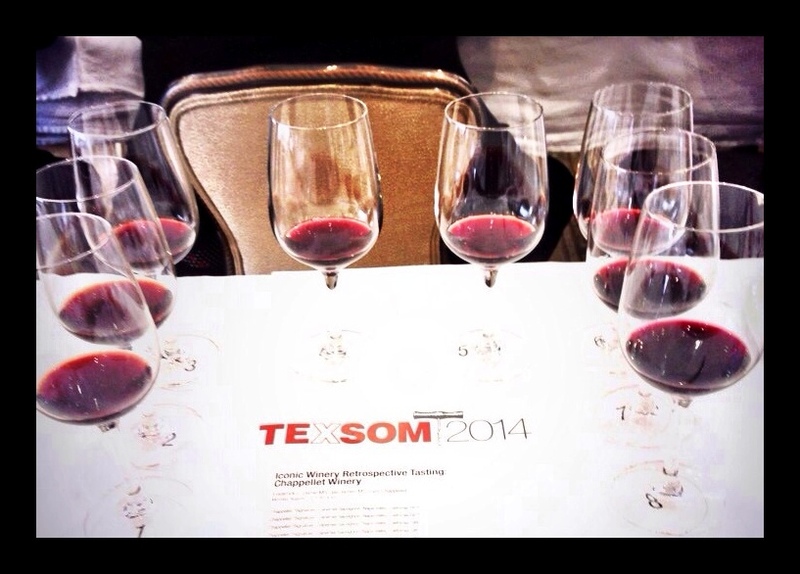 I truly cannot say enough about TexSom 2014 so please visit their web site for all the information on the seminars, sponsors, and events! 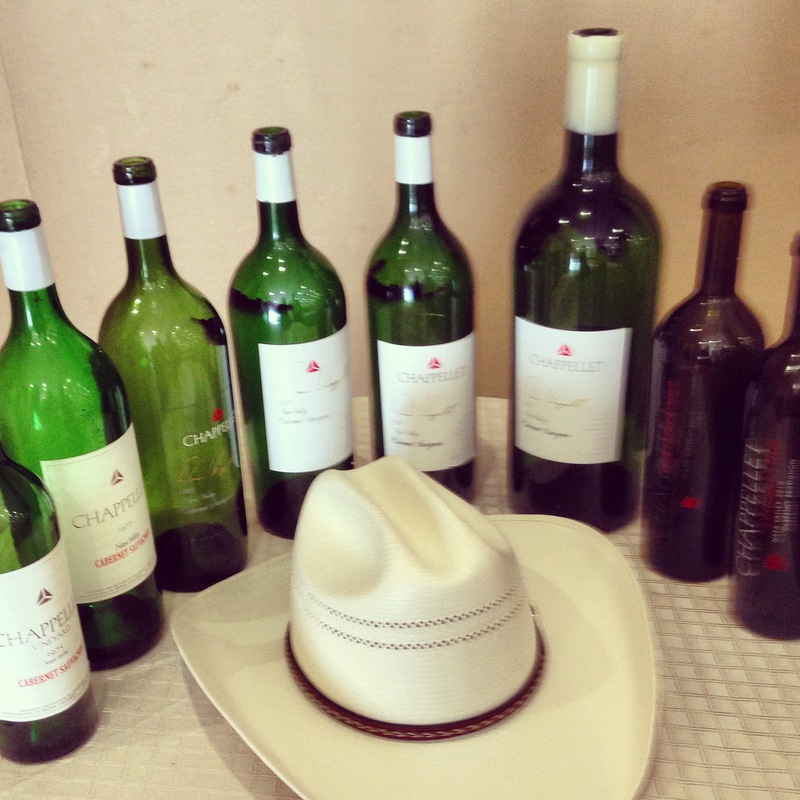 There were so many great wine tasting highlights for me at TexSom 2014 including the Berringer 1998 Napa Valley Private Reserve Cabernet Sauvignon that was served at Sunday’s lunch (along with Stag’s Leap 2010 The Leap Cabernet Sauvignon and Cinq Cepages 2010 Chateau St. Jean Sonoma County Red Blend), Quintessa Rutherford Red Wine served at tasting breaks and the 2010 Opus One served at the Grand Tasting. Some wines are just too good to spit! However, the seminar that topped my list of WOW was “Iconic Winery Retrospective Tasting: Chappellet Winery.” I knew I was in for a treat when I walked into the conference room and Cyril Chappellet (President of Chappellet Winery and son of Don and Molly, founders of Chappellet Winery) was flanked by Master Sommeliers Fred Dame and Jay James, both “rock stars” of sorts in the industry. As my eyes moved from the front of the room to finding a seat I had a “holy crap” moment! In front of every seat were 8 wine glasses, each holding a taste of Chappellet Cabernet Sauvignon. My second “holy crap” moment came when I examined the tasting list lying within the glasses! As I share my brief tasting notes of these 8 wines there were important elements worthy of note; each of the eight Cabernet’s delivered the same flavor profile with little variance, each were harmoniously balanced with refined tannins, eloquent acidity, and full mouth feel of velvety goodness with no sharp edges. 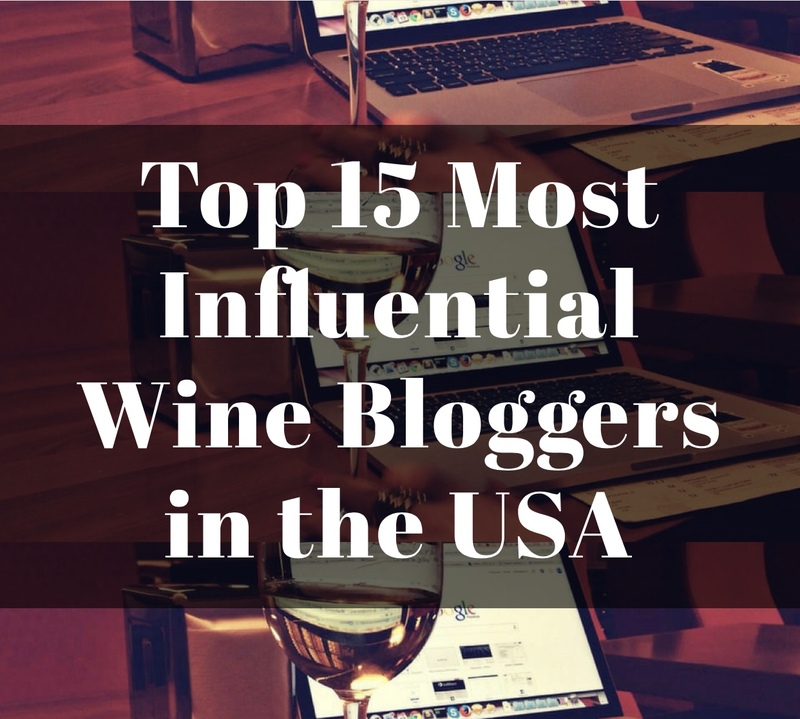 It was incrediblely impressive for wines that span 35 years! 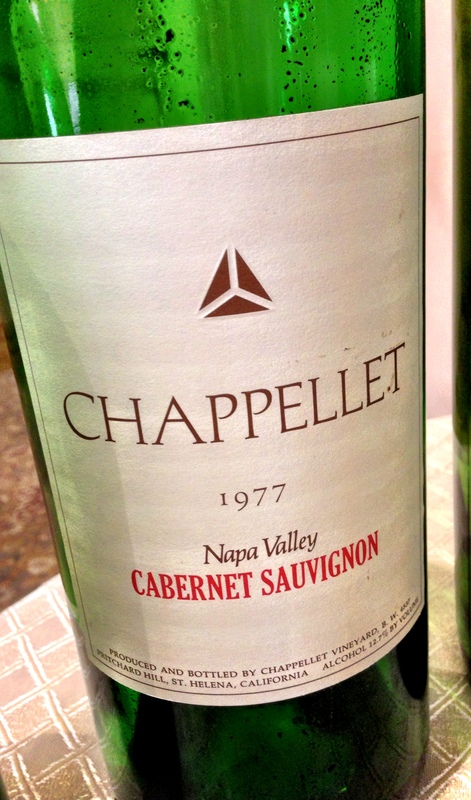 Chappellet “Signature” Cabernet Sauvignon, Napa Valley 1977: Tony Soter was the winemaker; same color, not decanted, sediment in the glass, great aroma, brought flavors of refined dark cherry, pepper, oak, restrained with well balanced acidity and tannins, long finish. Like the 1975, this wine was also only moved once from Chappellet cellar to our tasting table. Beautiful wine! Chappellet “Signature” Cabernet Sauvignon, Napa Valley 1980: Cathy Corison was the winemaker; medium garnet with sediment in the glass, garnet with less brown streaks, nice fruit profile, this wine had grip, fruit was slightly bigger than previous two, hint of pepper and oak, grippy tannins, forward acid, full mouth, long finish. This wine was quite delicious and very good drinking 24 years later. 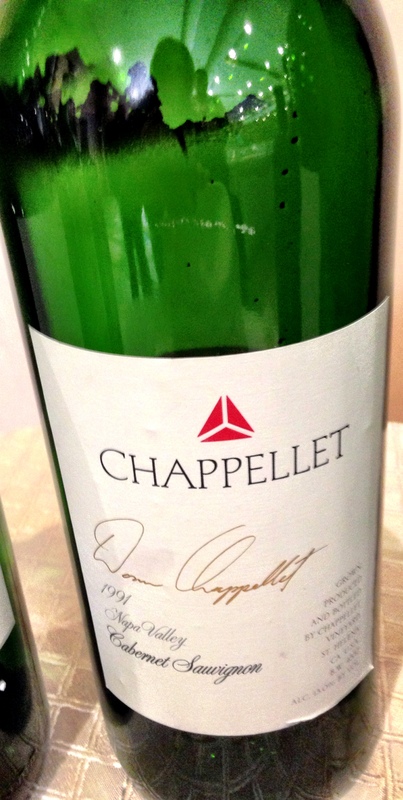 Chappellet “Signature” Cabernet Sauvignon, Napa Valley 1987: This wine was also made by Cathy Corison; medium garnet with light brown streaks, sediment, more pronounced cherry, spice and oak with a touch of heat (bell pepper), refined tannins, balanced acidity, full body, long finish, exquisite wine. Chappellet “Signature” Cabernet Sauvignon, Napa Valley 1991: Phillip Titus was the winemaker of this vintage and remains Chappellet’s winemaker to present; garnet with orange highlights, elegant wine, beautifully balanced cherries, spice and oak with a hint of pepper; well balanced acidity, refined tannins, full body with a long finish. This was a cool season and the 5th year of a drought. Truly outstanding wine. Chappellet “Signature” Cabernet Sauvignon, Napa Valley 1997: Beautiful garnet, great aroma, bright ripe cherries, spice, oak and pepper; modern flavor profile, nice viscosity, only Chappellet “Signature” cab with 6% Cab Franc added; well balanced acid and tannins, full body, long finish. This wine was my overall favorite; though that does not say much since they were all spectacular! Chappellet “Pritchard Hill Estate Vineyard” Cabernet Sauvignon, Napa Valley 2005: Even more modern flavor profile, dark garnet, high viscosity, bright cherries and raspberries with pepper and oak; well balanced acid, refined tannins, full body, long finish. 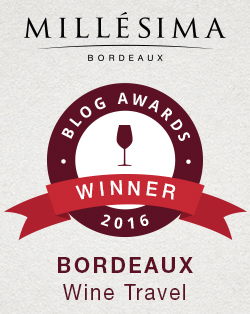 Excellent wine with a modern taste. All Pritchard Hill wines undergo a double selection process from the 34 distinctive blocks, including 25 blocks of Cabernet Sauvignon grapes. Chappellet “Pritchard Hill Estate Vineyard” Cabernet Sauvignon, Napa Valley 2010: Deep garnet with purple streaks; bigger flavor profile, including flavors ripe cherries boysenberries, and blackberries, along with spice, anise, toasted cedar and a hint of espresso; this wine was crafted from 75% Cabernet Sauvignon, 14% Petit Verdot and 11% Malbec; it brought great tannins and acidity, full mouth feel with a long finish. 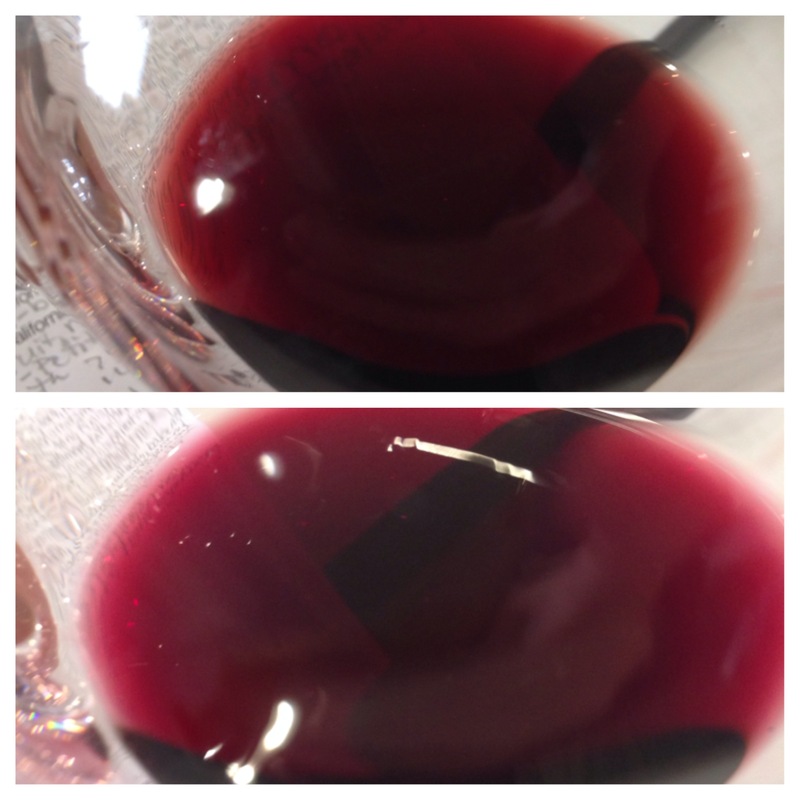 A rockin red for sure that drinks great now; imagine what it will taste like in 30 years! 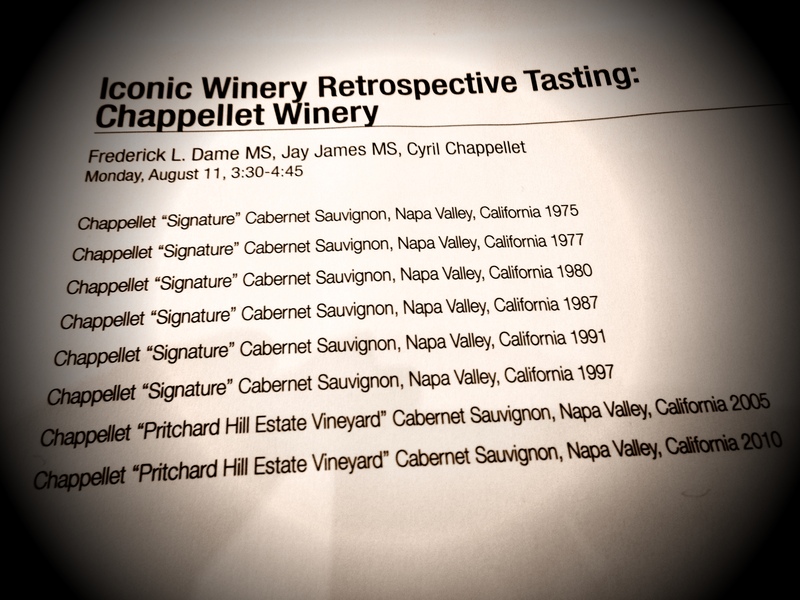 *One side note, during a tasting break Chappellet also shared with TexSom their 2012 Chenin Blanc which tasted like crème brulee (outstanding and a huge hit among participants) as well as their 2007 and 2010 Cabernet Franc which were both outstanding wines. 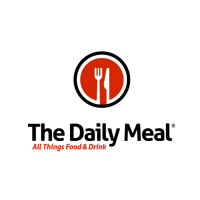 I encourage you to visit their web site to read about this great winery as well as view their entire portfolio of wines. 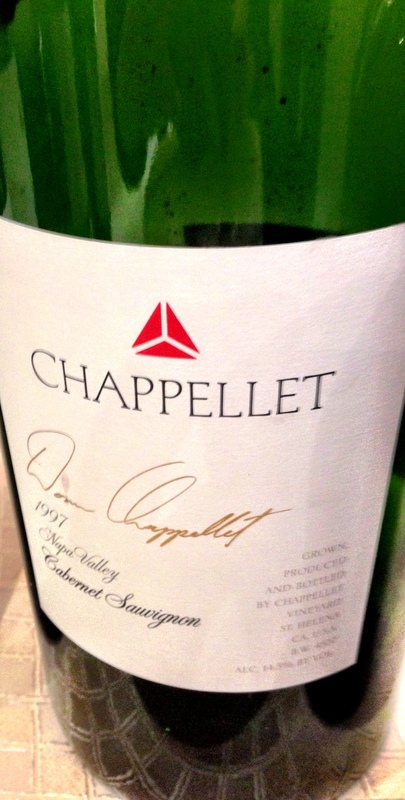 Chappellet is one of Napa Valley founding families and a perennially exceptional winemaker. 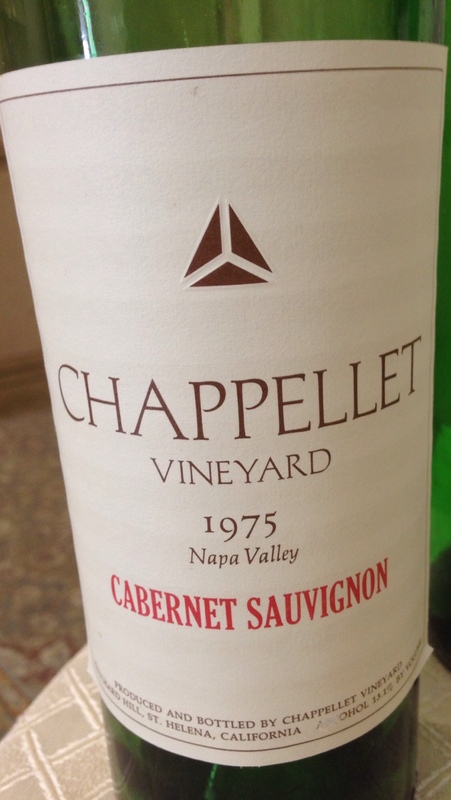 The fact that their eight Cabernet Sauvignon’s spanned almost 40 years and still maintained the same flavor profile and quality allows the modern buyer solace that buying Chappellet today means buying great wines for today and tomorrow. My Song Selection: The song I have chosen to pair with this outstanding tasting event from Chapellet is Heart’s 2012 Lincoln Center Honors Dedication of Stairway to Heaven to Led Zepplin, featuring Jason Bonham on drums. The original Stairway to Heaven is of course an iconic rock song and great in its original form; but this dedication version is something to be heard! Not only does it truly honor the great song writing and musicianship of classic Led Zepplin but it brings something new and fresh (yet fitting) to the mix. 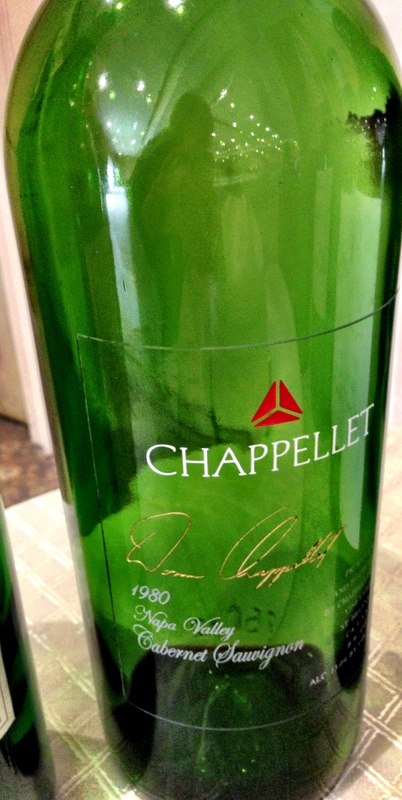 (If you have not seen it I do not want to give anything away) I believe it pairs well with the Chappellet tasting because we began with an icon wine of the 70’s and ended with something modern and fresh, yet quality and taste was maintained steadily throughout. You must watch (to see Yo Yo Ma rockin and Robert Plant moved to tears) and listen to this performance; it is every bit as outstanding as the Iconic tasting of Chappellet. Get your own current releases of Chappellet’s Pritchard Hill Estate Vineyard Cabernet Sauvignon, Cabernet Franc and Chenin Blanc and let me know what song you would pair with them. Cheers! Next Valpolicella Here I Come! Sounds like it was a great time and you were able to experience something really fun and unique! Cheers. It was quite special and so generous of Chappellet to share their wines with us. Cheers!